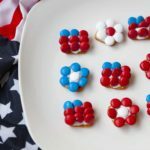 Super fun and easy Patriotic Pretzel Bites! Perfect for the 4th of July or Memorial Day celebrations. Line rows of square pretzels on the baking sheet in rows. Put a white candy melt in the center of each pretzel. Then, place the tray in the oven for 2 minutes, or until the candy melts are soft, watching carefully. To arrange M&M candies to look like a flag, place them at a 45 degree angle. To arrange M&M candies to look like a flower, place them flat down starting with the center and going around. Allow them to sit for roughly 10 minutes to harden. Enjoy!